Steve Scott secured a fifth shooting place for Britain at the 2016 Olympic Games by winning World Cup silver. 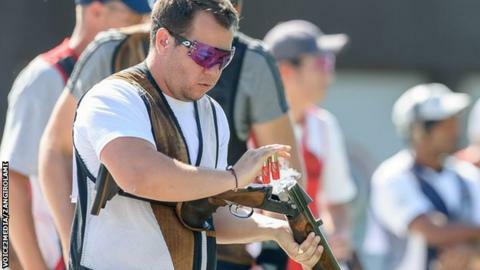 The 30-year-old reached the gold medal match but lost to American Walton Eller in the double trap at the Gabala World Cup meet in Azerbaijan. Scott, based in Battle, East Sussex said his only goal for the past year had been to win a quota place for Rio. "I was very nervous going into the semi-final because there was so much riding on it," he said. "But my training kicked in and thankfully I was able to just stick to my technique and keep hitting the clays," he added. "After achieving the goal I've been aiming for over the last year, I relaxed quite a lot going into the gold medal match. "As much as I wanted to go on and win, I think I probably took my foot off the gas a little bit." He joins Amber Hill, Ed Ling, Elena Allen and Jennifer McIntosh in the list of British Shooting athletes who have secured Team GB quota places for Rio 2016.